Marian Barnes is best known as an artist who painted flower pictures in watercolours, and the above is one of her larger works - in fact exceptionally large for a watercolour. 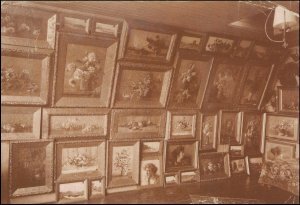 She exhibited pictures primarily in London during the years 1890 to 1913. For example she exhibited 22 works at the Royal Academy, 22 at the Royal Institute of Painters in Watercolours, 19 at the Royal Society of British Artists, 18 at the Society of Women Artists and 4 at the Royal Hibernian Academy. Marian Barnes was born in St. Georges, Deptford in south east London and later lived in Blackheath and Lewisham where her mother Matilda seemed to run a photographic business with her daughters. In later life the family moved to Cliftonville and subsequently Westgate-on-Sea near Margate in Kent. She is buried in Margate Cemetery with three of her four sisters. Her father, Robert, was a sea captain and allegedly none of his daughters married because the suitors were never good enough for their father. The following is a quotation from the "Evening Standard" of June 9th, 1910, referring to an exhibition of her paintings at the Newman Gallery in Oxford Street, London: "All A-Blowing! 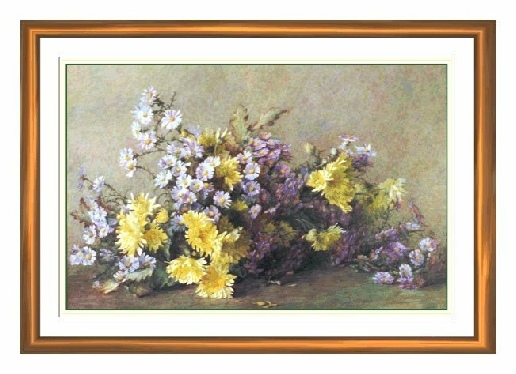 - If not a-growing are the flowers, painted in water-colour by Miss Marian L. Barnes, now on view at the Newman Art Gallery. The good flower painter pursues a method exactly opposite to that recommended in grasping a nettle. By means of a light hand in arrangement and a loose touch in painting, Miss Barnes manages to preserve the breath and freshness of her subjects to a remarkable degree. Her flowers are not scattered all over the shop; they are arranged, but in bold masses, and lighted so that the interest is concentrated, with the result of a decorative unity." Pictured right is a portrait photograph of Marian Barnes, and below is a photograph taken in her studio in Blackheath (the first painting above can be seen on the left of the picture - it has since been reframed). There are some portraits in this scene, one of which is shown below, and there are also some landscape scenes. Apparently she in addition produced some sculptures but these were mostly destroyed when the house in Blackheath was bombed during the second world war. 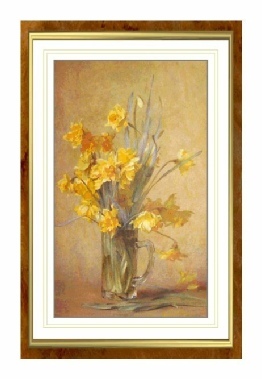 Marian Barnes used to frame the pictures herself, doing the creation of the intricate mouldings and gilding. The photographs on this page and the lower flower painting are shown courtesy of Rita Townsend who acted as a chauffeur for the sisters in the early 1930s when they lived in Margate. Marian Barnes specialised in pictures of flowers but she was also capable of handling other subject matter very well as shown in the example above which is a portrait she did of her sister Valerie Barnes. (This image was donated by a private collector). 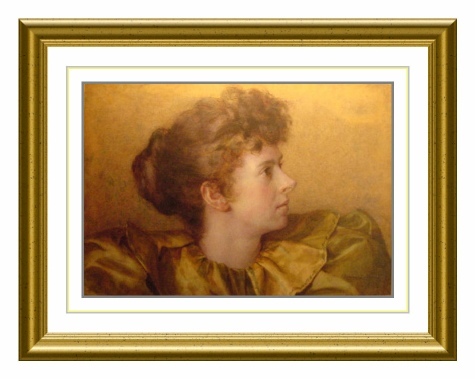 Valerie Louise Barnes was three years younger than Marian Barnes, being born in about 1865 so she would have been 27 when this picture was painted in 1892. She died in 1946 aged 81, and she is buried in the same grave as Marian. 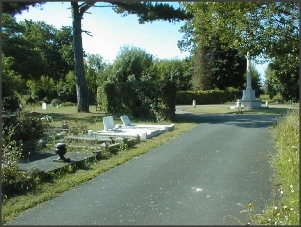 A photograph of the grave is shown below (in Margate cemetary). According to their chauffeur, Valerie was the prettiest of the sisters as one can well believe from this painting.